Though their name might conjure embarrassing memories of the late 1970s, Panic at the Disco crashes straight into 1967 on their second record, Pretty. Odd, a beguiling and completely unexpected album that unashamedly apes Sgt. Pepper right down to the letter. In fact, it’s about as shameless a musical homage as you could imagine, filled with music-hall shuffles and cheerful British chamber pop, polite ballads and horn-laced jaunts, even a goofy declaration of intent that opens the album on a note bizarrely similar to the first track on Sgt. Pepper. It’s an album so utterly strange that it’s hard to tell whether it’s meant in earnest or as tongue-in-cheek; just when one wonders if the band is dipping into parody, they do something that’s either so seemingly sincere or so completely left-of-center that you’re forced to think that this isn’t the joke, just the sound of a bunch of emo-rock upstarts who discovered the Beatles late in life and now seek to imitate them with zeal and gusto. The fact that, well, that’s been done a few times before only adds to the bafflement here; there’s such cheerful sincerity here that it almost sounds like the band thinks Beatles emulation is something new. So strange though it may be, it feels very much like a labor of love, with the band members throwing themselves into it and following their newfound muse with enthusiasm. They may be working with painfully familiar elements here, but there’s so much beauty, so much passion, and so much fun on display here that it feels as if these vintage sounds are being heard anew. 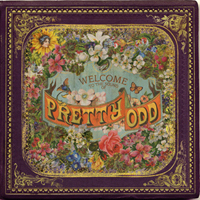 It’s pretty odd, alright, but it’s also pretty delightful.